Edited by: Julia Besten, Christoph Schwab. 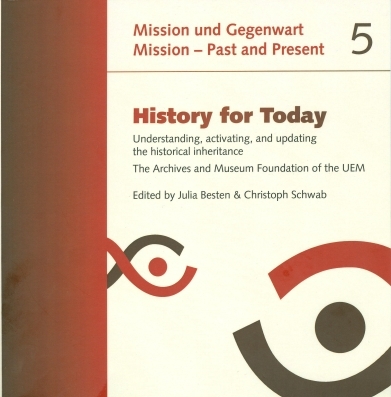 Series edited by: Archiv und Museumsstiftung der VEM, Wuppertal. whose beginnings reach deep into the past faces cen­tral and inevitable questions about its historical inheritance. This generally occurs after there has been a re­structuring. How does one interface with historical documents that were collected over several time periods, and whose numbers, as work continues, are steadily increasing? Is a proper archival and preservation process the right thing to do, in the sense of administering general requirements in an orderly fashion and accord­ing to the rules? Is it enough? Or are there obligations that extend beyond the valid claims from individual members of the organisation itself, or from third parties whose historical questions directly or indirectly affect this inheritance? Finally, is there a will within the organisation to open up its archives and collec­tions to other institutions and potential users who might be interested in working with this material as well? Does the organisation seek to cooperate with them in order to work through its own past scientific­ally, to gain new insights and establish networks that will make it possible to contextualise similar hold­ings? introduced, presenting the quintessential work and services performed by the foundation. should benefit not only the members of the parent organisation, but the largest possible number of diverse social groups in Germany and abroad as well.